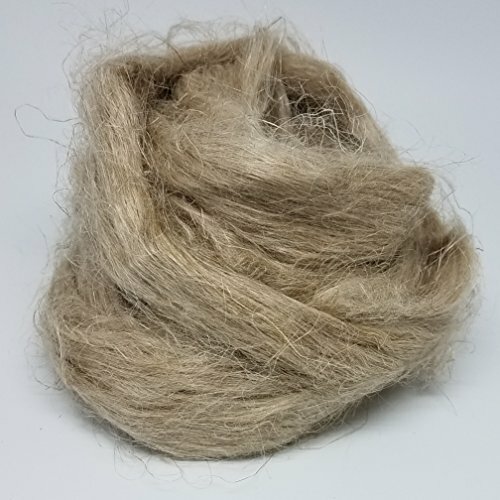 Natural Flax Fiber for spinning into linen. 4 oz package Flax is an ancient fiber that can be spun and made into fabric called linen. It can be knitted, crocheted, woven and felted to make a wide assortment of items such as table linens, bed sheets and under-garments. The fiber is coarse in the beginning but softens with use and washing. Flax fibers are stronger than cotton but not as flexible and tend to wrinkle. They take dyes but not as vividly as wool fiber. It can be spun by itself or blended with other fibers to make unique and one of a kind spinning fibers. I find it has quite an "earthy" smell when spinning. This roving can be spun dry or you can dampen your fingers to smooth the flyaway strands. I have spun both ways and found that I spin faster and more consistently when I spin dry. To finish the yarn and set the twist I simmered the flax in water with just a bit of fabric wash then re-skeined the yarn and let it dry under slight tension. The yarn was very coarse when I started knitting but the finished work softened considerably. If you have not tried spinning flax, it is not at all complicated. I spun short forward draw and from the fold. I was able to spin a very fine lace-weight that held together really well. It was very easy to draft. The roving requires no special preparation. I would recommend a towel or lap pad as there might be some chaff as you spin. You do not need a distaff or any other special equipment so try flax! You might find you like it! If you have any questions about this product by MK Unique Designs, contact us by completing and submitting the form below. If you are looking for a specif part number, please include it with your message.